The Qt Bluetooth Low Energy API for the central role was introduced by Qt 5.4. Since Qt 5.5 that part of the API is final and a compatibility guarantee is given for future releases. Since Qt 5.7, additional API supporting the peripheral role was added as a Technology Preview, with the backend implemented for Linux/BlueZ, iOS and macOS. Bluetooth Low Energy uses a client-server architecture. The server (also known as peripheral) offers services such as temperature or heart rate and advertises them. The client (known as central device) connects to the server and reads the values advertised by the server. An example might be an apartment with Bluetooth Smart Ready sensors such as a thermostat, humidity or pressure sensor. Those sensors are peripheral devices advertising the environment values of the apartment. At the same time a mobile phone or computer might connect to those sensors, retrieve their values and present them as part of a larger environment control application to the user. Bluetooth Low Energy is based on two protocols: ATT (Attribute Protocol) and GATT (Generic Attribute Profile). They specify the communication layers used by every Bluetooth Smart Ready device. The server stores the attributes and the client uses the ATT protocol to read and write values on the server. GATT specifies that the above used UUID 0x2800 marks the begin of a service definition. Every attribute following 0x2800 is part of the service until the next 0x2800 or the end is encountered. In similar ways the well known UUID 0x2803 states that a characteristic is to be found and each of the characteristics has a type defining the nature of the value. The example above uses the UUIDs 0x2A08 (Date Time) and 0x2A37 (Heart Rate Measurement). Each of the above UUIDs is defined by the Bluetooth Special Interest Group. and can be found in the GATT specification. While it is advisable to use pre-defined UUIDs where available it is entirely possible to use new and not yet used UUIDs for characteristic and service types. In general, each service may consist of one or more characteristics. A characteristic contains data and can be further described by descriptors, which provide additional information or means of manipulating the characteristic. All services, characteristics and descriptors are recognized by their 128-bit UUID. Finally, it is possible to include services inside of services (see picture below). This section describes how to use the Bluetooth Low Energy API provided by Qt. On the client side, the API permits creating connections to peripheral devices, discovering their services, as well as reading and writing data stored on the device. On the server side, it allows to set up services, advertise them, and get notified when the client writes characteristics. The example code below is taken from the Heart Rate Game and Heart Rate Server examples. The above code snippet how the application initiates the service discovery once the connection has been established. The serviceDiscovered() slot below is triggered as a result of the QLowEnergyController::serviceDiscovered() signal and provides an intermittent progress report. Since we are talking about the heart listener app which monitors HeartRate devices in the vicinity we ignore any service that is not of type QBluetoothUuid::HeartRate. In the code example above, the desired characteristic is of type HeartRateMeasurement. Since the application measures the heart rate changes, it must enable change notifications for the characteristic. Note that not all characteristics provide change notifications. Since the HeartRate characteristic has been standardized it is possible to assume that notifications can be received. Ultimately QLowEnergyCharacteristic::properties() must have the QLowEnergyCharacteristic::Notify flag set and a descriptor of type QBluetoothUuid::ClientCharacteristicConfiguration must exist to confirm the availability of an appropriate notification. In general a characteristic value is a series of bytes. The precise interpretation of those bytes depends on the characteristic type and value structure. A significant number has been standardized by the Bluetooth SIG whereas others may follow a custom protocol. The above code snippet demonstrates how to the read the standardized HeartRate value. Now potential clients can connect to our device, discover the provided service and register themselves to get notified of changes to the characteristic value. This part of the API was already covered by the above sections. 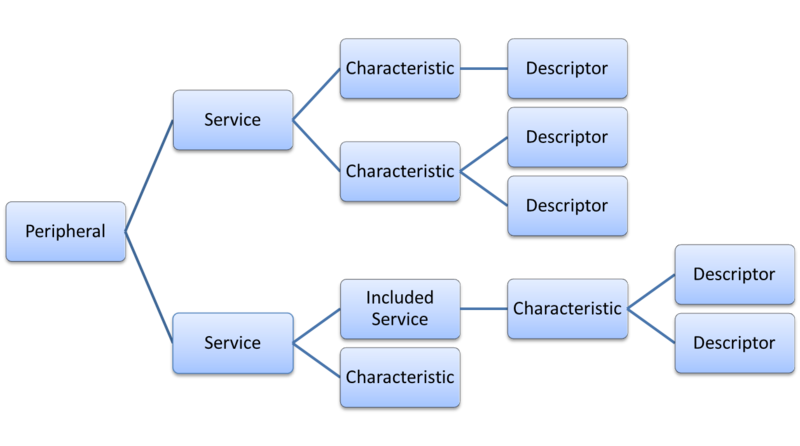 The first step is to define the service, its characteristics and descriptors. This is achieved using the QLowEnergyServiceData, QLowEnergyCharacteristicData and QLowEnergyDescriptorData classes. These classes act as containers or building blocks for the essential information that comprises the to-be-defined Bluetooth Low Energy service. The code snippet below defines a simple HeartRate service which publishes the measured beats per minute. An example where such a service could be used is a wrist watch. The resulting serviceData object can be published as described in the Advertising Services section above. Despite the partial information overlap between the information wrapped by QLowEnergyServiceData and QLowEnergyAdvertisingData the two classes serve two very different tasks. The advertising data is published to nearby devices and often limited in scope due to its size restriction of 29 bytes. Therefore they are not always 100% complete. By comparison the service data contained inside of QLowEnergyServiceData provides the complete set of service data and only becomes visible to the connecting client when a connection with an active service discovery has been performed. The next section demonstrates how the service can update the heart rate value. Depending on the nature of the service it may have to comply with the official service definition as defined on https://www.bluetooth.org. Other services may be completely custom. The heart rate service was adopted and its specification can be found under https://www.bluetooth.com/specifications/adopted-specifications. In general characteristic and descriptor value updates on the peripheral device use the same methods as connecting Bluetooth Low Energy devices.